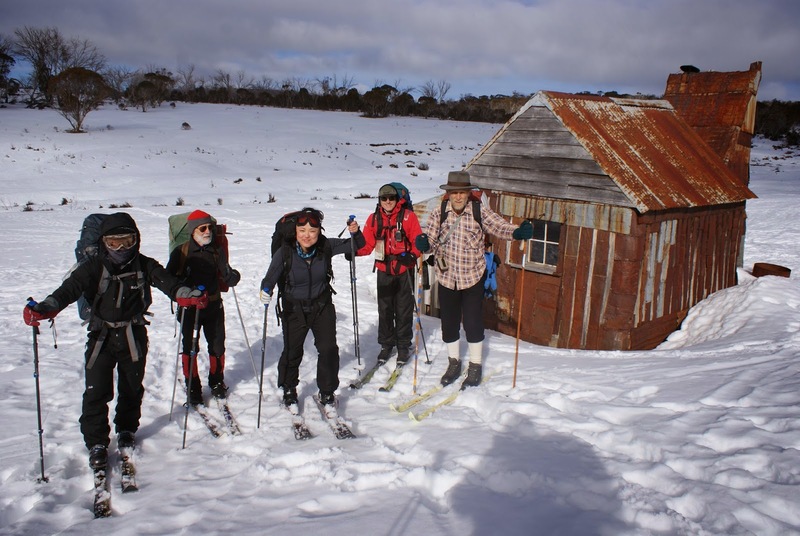 6 Go to Four Mile Hut on Cross-Country Ski, 26-27 July, 2014. 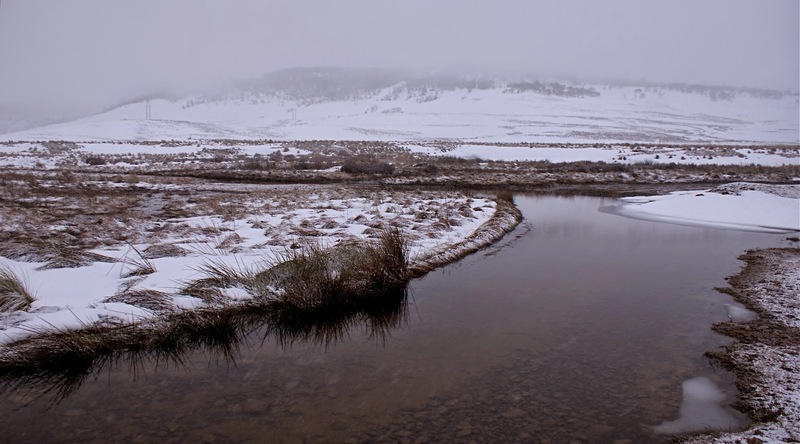 Northern end, Kosciuszko National Park, NSW, Australia. 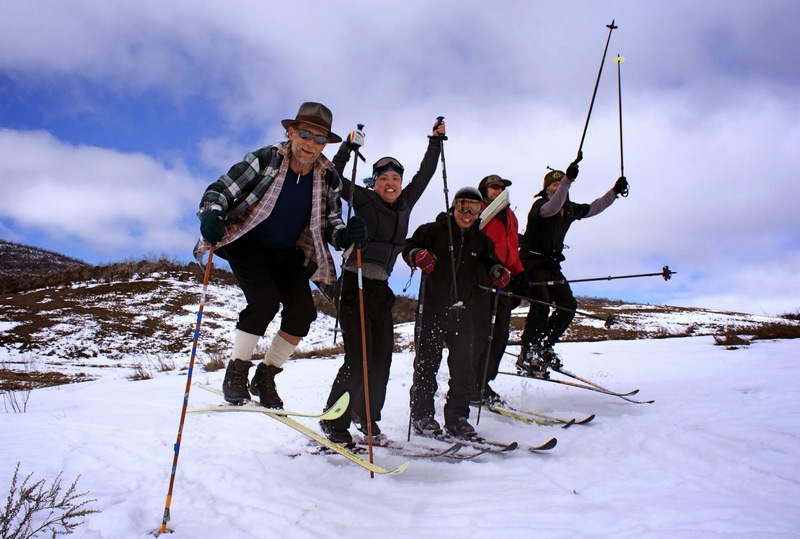 A ski tour with the Nordic Ski Club, NSW. A trip report by Andrew Stanger. 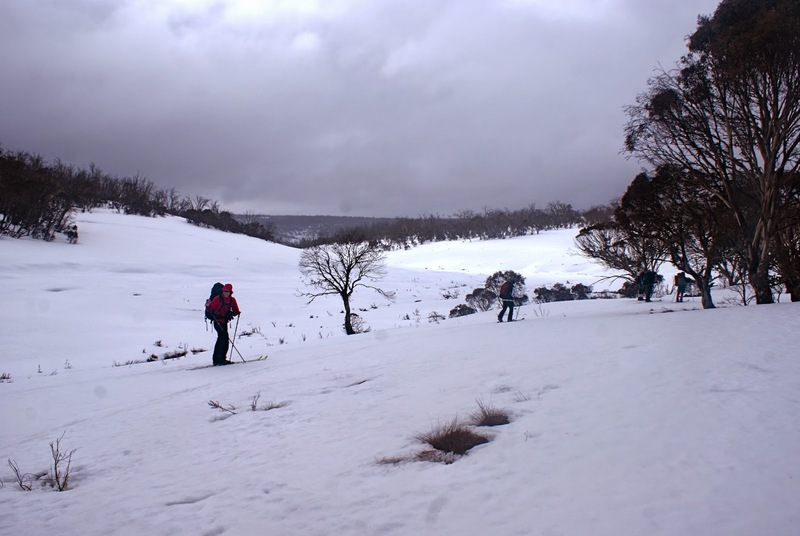 Time to Go Touring the Low Country: 6 Go to Four Mile Hut on Cross-Country Ski, 26-27 July, 2014. This year the snow-maker had been doing an exceptional job, providing regular, heavy dumps of dry snow to low levels since late June, early July. 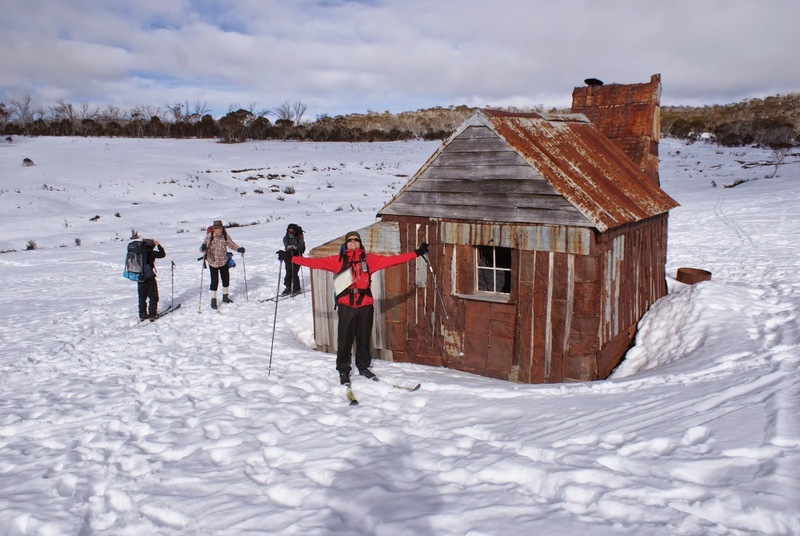 When I heard about a trip to Four Mile Hut (1467m) in the northern end of Kosciuszko National Park I was excited by the prospect of skiing into the hut and touring the surrounding country. Not because it is steep or a long way or remote, but because of the rarity of skiing into this unique subalpine environment steeped in history. 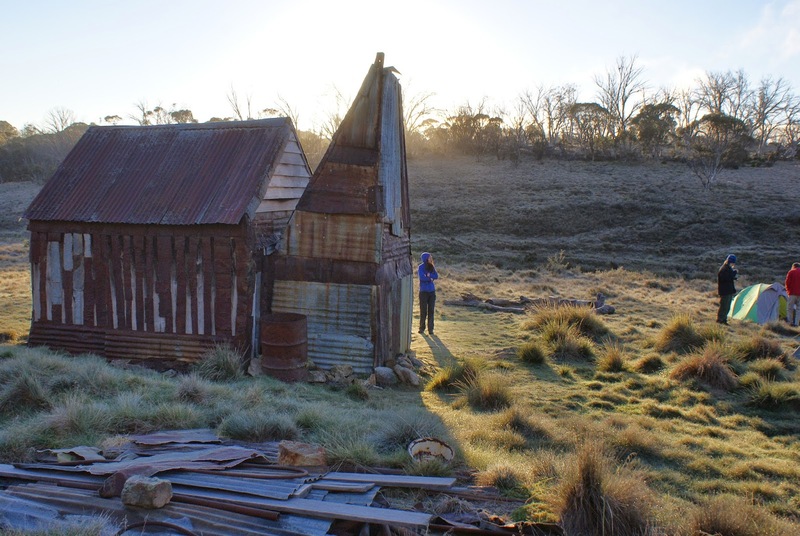 I had walked through the area at Easter this year on the classic Kiandra to Kosciuszko walk, camping at the hut on the first night of that trip. I had also visited the area previously, walking, but never on ski. 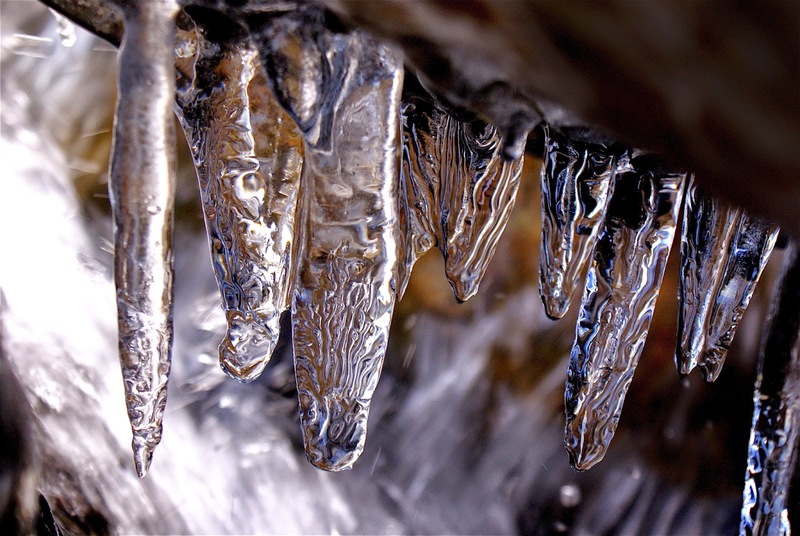 I knew some of the hidden terrain and beautiful subalpine landscape of the Four Mile Creek valley; its offshoots and side valleys, the partially treed slopes and the lower treeless frost hollows of other minor creeklines. I knew of a waterfall at a mid-section headwall of the creek where the valley sides steepen and close in the otherwise moderately wide valley. 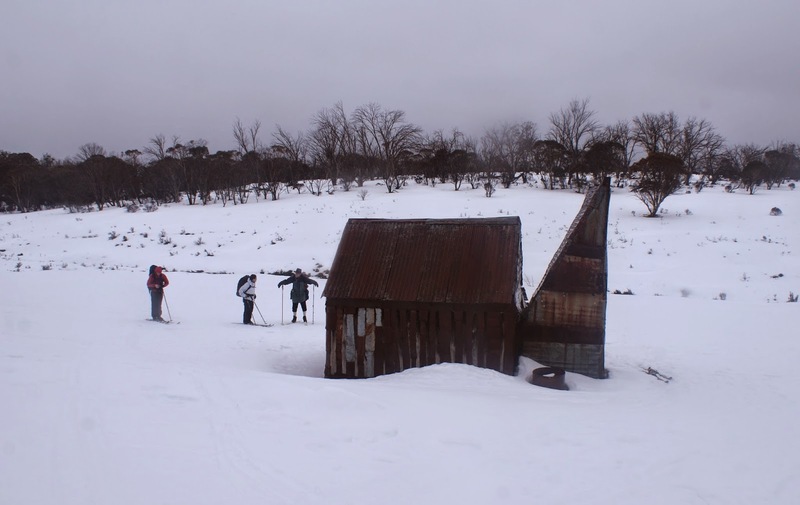 To ski this area on plentiful snow and stay at this fantastic, small, rustic hut, with its weathered skin of timber and kerosene tin, in winter, with snow up to the eaves (almost), is a rare event I didn’t want to miss. Friday afternoon, 25th July, 2014 had arrived. I got away from the Central Coast at about 4.30pm. A bit later than what I had intended. My two travelling companions, Nick and Lilian were waiting as arranged and soon we were away, heading south. We drove through the afternoon making good progress and then into a dark, but clear, starry night. The drive was good. 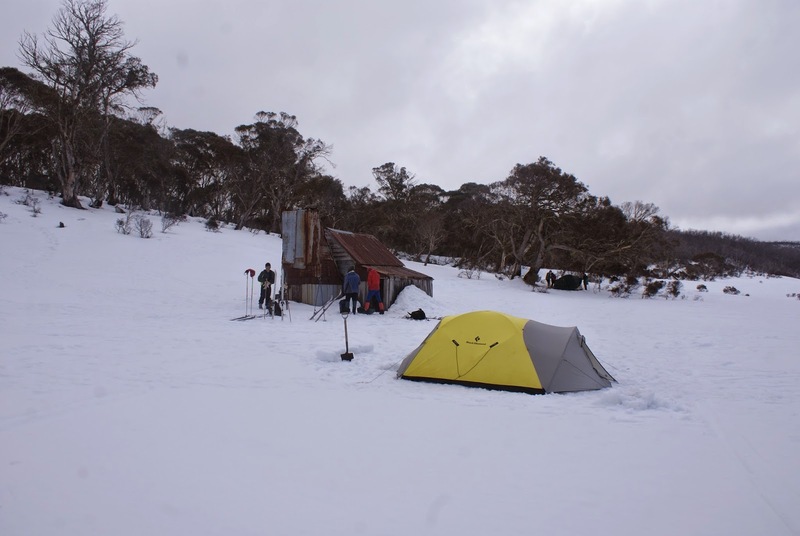 We were in Cooma by 10.30pm and headed for Delanys hut on the Snowy Mountains Highway, within Kosciuszko National Park. 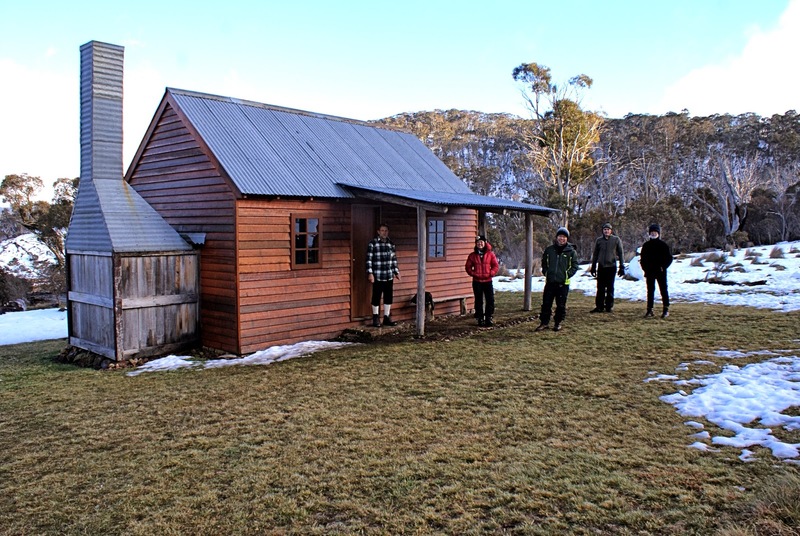 Delanys Hut at 1373m, has a long history of being used for stop-overs. 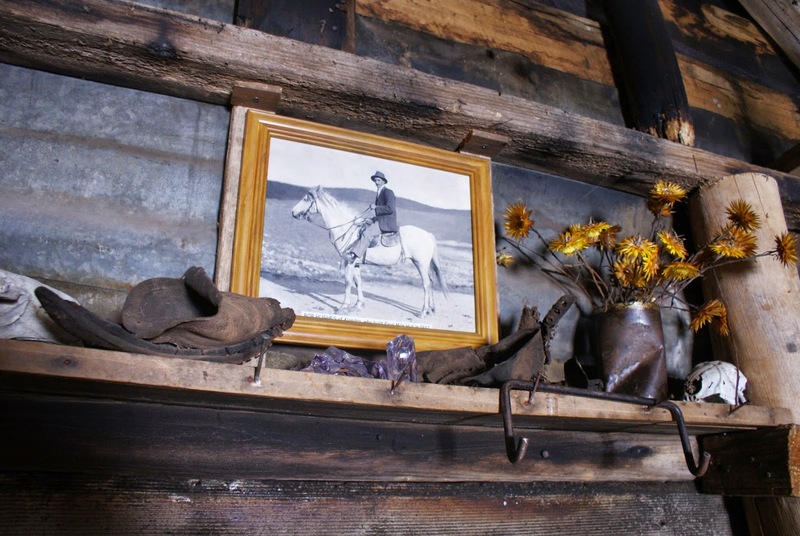 The original hut was built in 1910 by Thomas Delany, a cattle grazier. 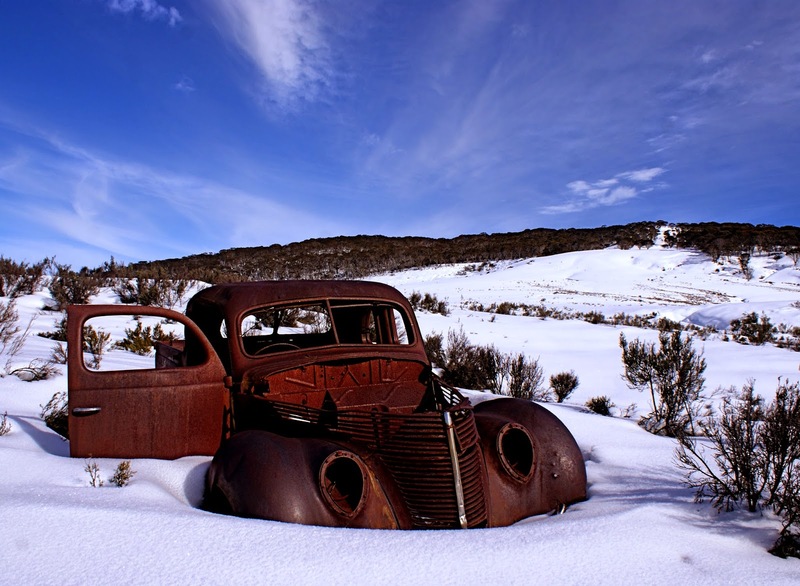 The Kiandra mailman would sometimes overnight here, swapping horse for snowshoes to get the mail through to the townsfolk of Kiandra some 20km away. The hut, built by Thomas was destroyed by wildfire in 2003 and rebuilt in 2007. Driving into the night from Cooma along the Snowy Mountains Highway we passed through Adaminaby. Continuing deeper into the mountains we passed kangaroo and wombat and left farmland for forest. 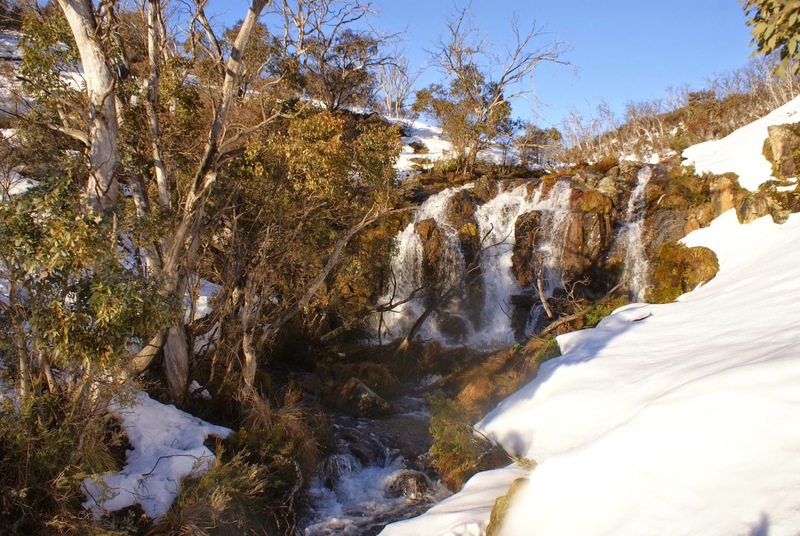 We passed the Tantangara trail, the roadside now with snow, until we reached Delanys carpark and pulled in off the Highway. We arrived some time after midnight. Bunkered down in Delanys, Nick and I slept soundly. There were patches of snow outside the hut with thicker coverage on the treed slopes. Lilian chose to sleep in my van. At about 4am the door of the hut creaked open. I was already stirring. Is it the mailman? No, Paul the instigator of this trip had just arrived. We exchanged a few words as he bunked down. Soon daylight and bird-call entered the hut and I was up and out. Clear sky, two tents and more cars in the carpark. The others had arrived during the night. There was now the 6 of us, plus one, at Delanys. 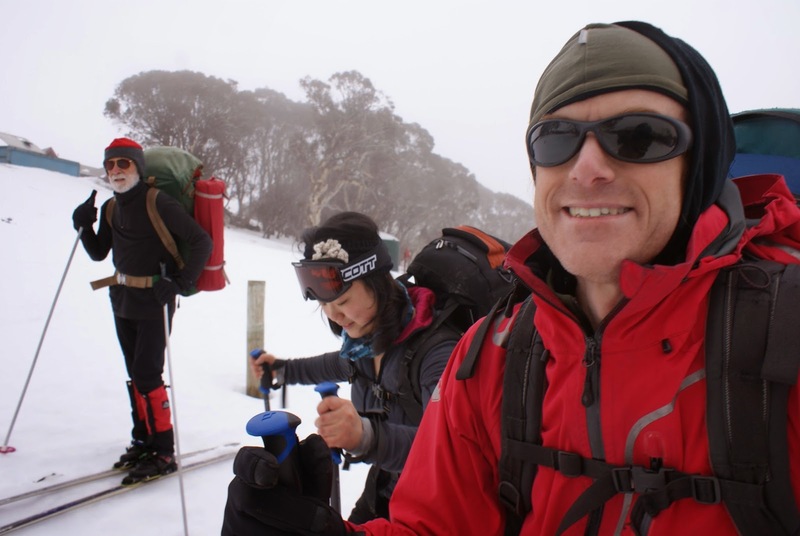 After some introductions and gear sorting we were off in cars for the 20km to the Mt Selwyn overnight carpark(1545m) where we were to meet again, leave our cars and set out on ski for our ski into Four Mile Hut (1465m). Paul, Hans, John, Lilian, Nick and myself, being the 6 to go to Four Mile Hut. 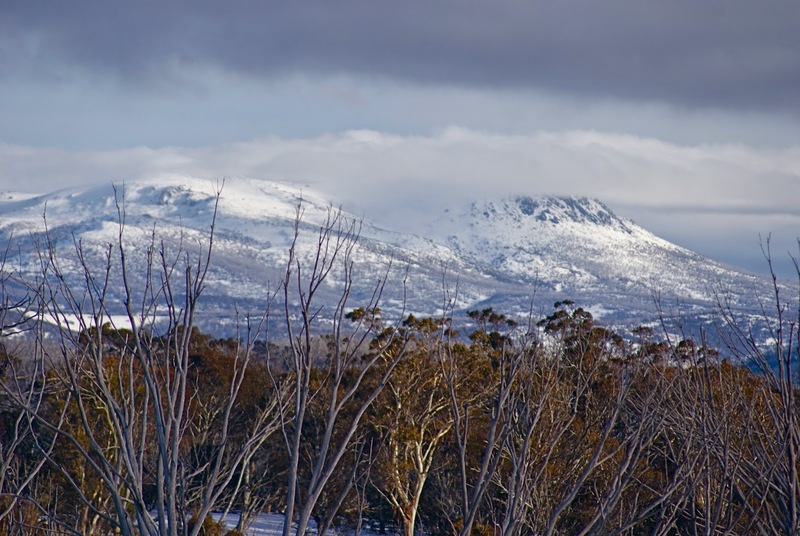 I wouldn’t have minded being the Kiandra mailman, the landscape from Delanys, westward, along the Snowy Mountains highway would have to be one of Australia’s most scenic drives. In any season it is spectacular. Pretty sweet spot to deliver the mail but the comforts for the mailman on snowshoe in the early 1900’s were far from the heated, dry comforts of the van we now travelled in. Still, there would have probably been a fire and boiling billy at the huts along the way for welcome warmth on those wild days. 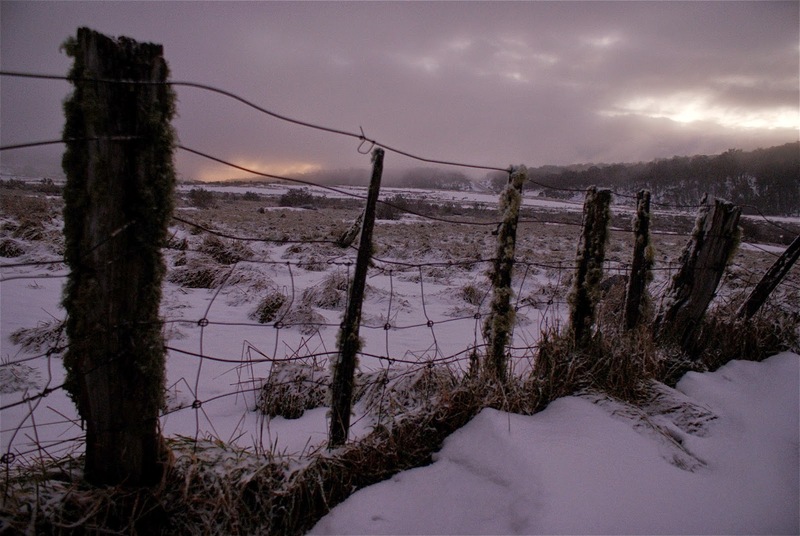 We drove west towards Selwyn (1545m), snow covered most of the landscape. We crested and rounded a bend of the highway(1485m) on the side of Sawyers Hill just after climbing past Sawyers Hut (1350m) and looked out over the vast vista of the long, sublime, Eucumbene River valley: a treeless valley enclosed by a dissected range of timbered hills. 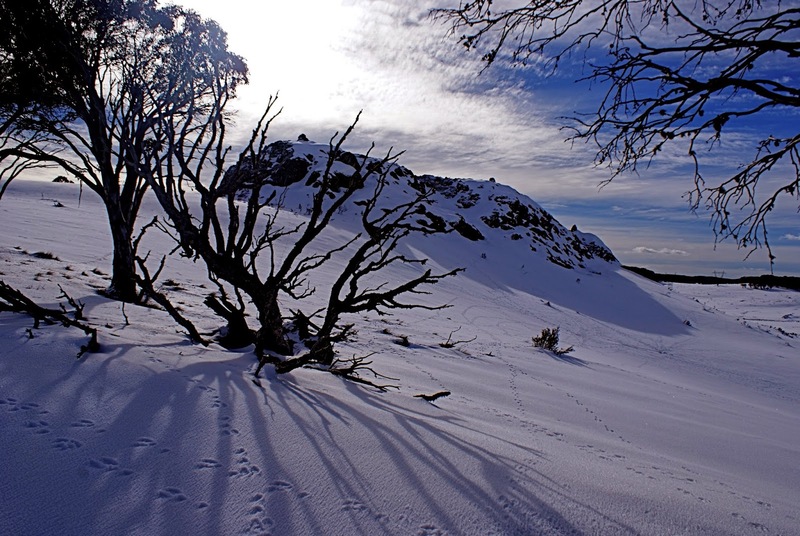 A beautiful, mysterious landscape, the result of eons of years of natural processes and relatively recent human toil and ambitions to strike the “cold gold” riches at what was known as the Kiandra Goldfields (1398m). I love this valley plain, the landscape, the way the river winds its way, the sense of human history, of the indigenous peoples habitation and movements, of the gold seekers, of the later day townsfolk that stayed through harsh winters of deep snow and travelled by horse, cart, and ski; isolated, without electricity. 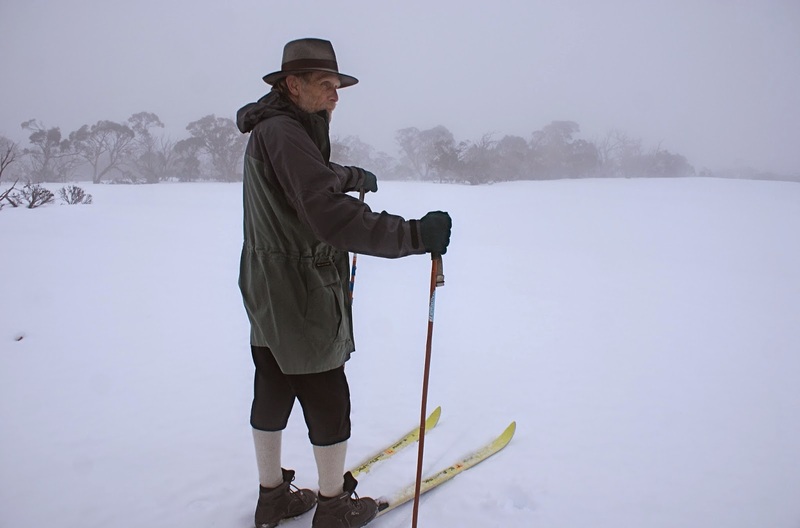 Of the postman travelling by horse and ski to get the mail through to people settled remotely across the Snowy Mountains. I think it is a mystical landscape. Those early settlers may have had other less romantic ways of describing it so I am told. To the indigenous tribes it was sacred ground. The overnight carpark at Selwyn was empty of cars. Snow pushed up from the carpark formed an enclosure in some places 1.2m high. There was plentiful firm snow all around with few bushes showing. Final bits and pieces were sorted. We loaded up our gear and set out from the carpark at about 10am, walking up the road as clouds started to come in from a west, north-west direction. The sun shone clear through breaks, the snow radiated a whiteness. Burnt snowgums: leafless, weathered, bleached, silhouetted a sky of broken cloud and sun. 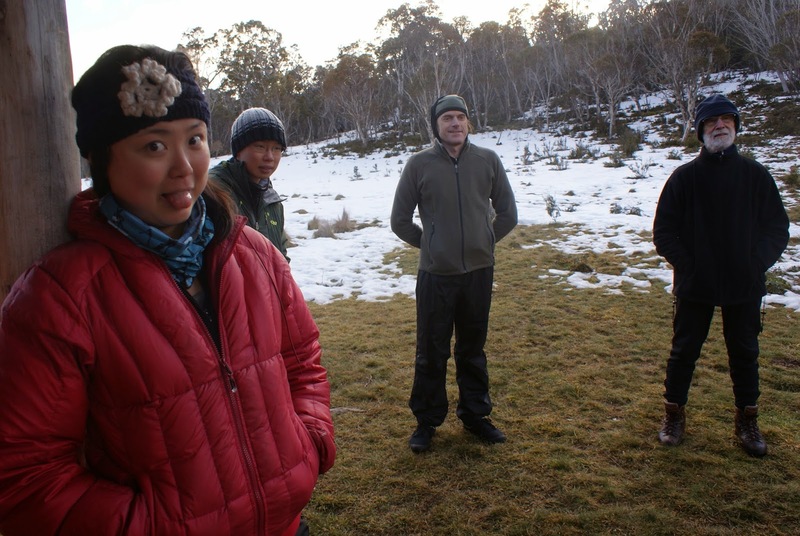 We gathered for group photos and set off, skis underfoot, packs upon backs, rugged up for the elements. The trail we took skirted the northern limit of the Selwyn ski resort infrastructure. It climbed east, gently, through the skeletal remains of old snowgum woodlands burnt by the 2003 wildfires that swept across the Snowys. We travelled along a ridge of the Great Dividing Range for approximately 1km, climbing steadily through the trees to a high point of 1600m. From here we tended to the E-SE along the undulating ridge, breaking out of the trees onto a broad, gently sloping snowfield after about 500m of easy travel. The snow was fresh and firm, the cover excellent. Sago snow and light rain had followed us along the ridge. 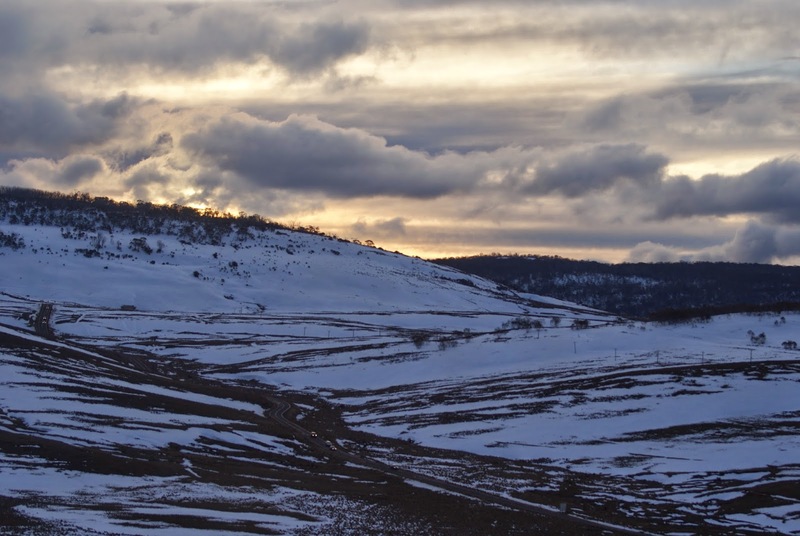 A light to moderate breeze moved us east and cloud hung at the 1700m contour allowing only the lower slopes of a snow-clad and forested ravine to the south to be revealed. Mt Jagungal and Tabletop Mountain lay out there at distance somewhere to the south and southeast but on this day we would never know. 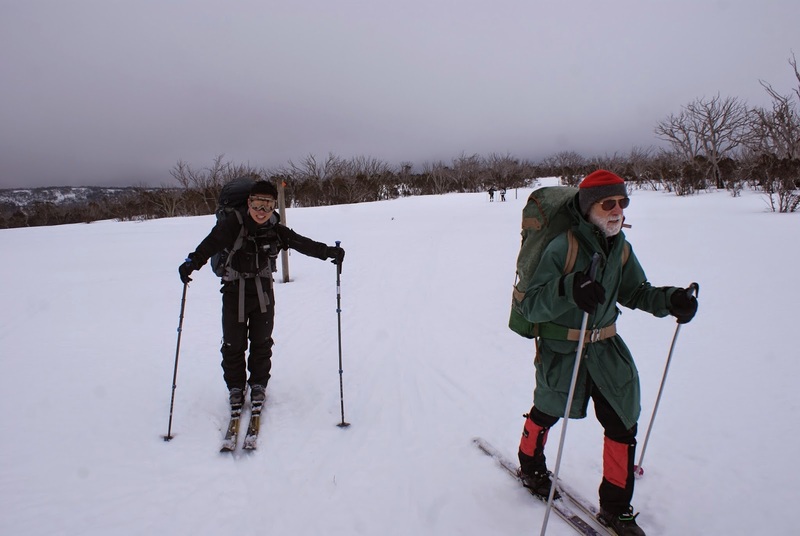 The distance from the carpark to Four Mile Hut is not great, being approximately 4.5 to 5km. Lunch was had enroute around the base of a leafless skeletal tree. Lunches were a mix of varied bites, just as the weather was a mix of sago and light rain, encouraging us to move on to reach the hut. A shaky downhill run brought us to an old fenceline and relic of a post and rail gate. We stopped to muse over the lives of the people that spent much of their time living in this area back in the mid 1800’s to mid 1900’s. The stories of these people are fascinating and inspiring. Leaving the Tabletop Mountain Fire Trail we set off east for the final run down to the valley of Four Mile Creek. Instead of following the route of the foot-track to the hut we went slightly north of east and along the slopes of a minor creek. Soon the narrow treed landscape of this creek opened up as a broad north-south running valley, higher in the south, dropping to the north. We were in the valley of Four Mile Creek, downstream of the hut. Paul got the people who had not been to the hut to go ahead and lead the way. They moved on as Paul, Hans and I waited. Soon their ski tracks were the the only sign of them being there. Last time I came to Four Mile hut I arrived by torchlight, in light rain with the smell of open fire swirling through the trees. This time we arrived by ski, in clearing weather with snow covering the ground. 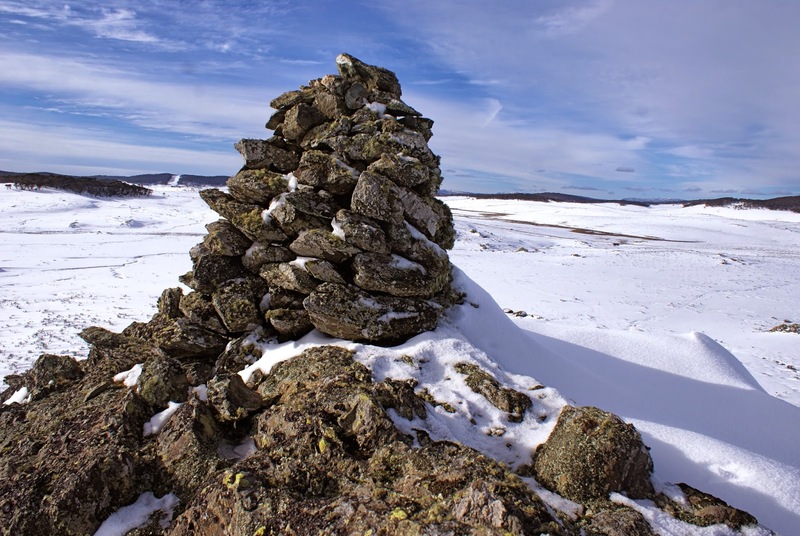 The hut stood welcoming, its rustic frame set against the white, snow about half way up to its low eastern eave. It was a beautiful sight welcoming. We arrived and went inside….home, the fire soon going. As a group we melded nicely right from the start. Sometimes we skied as 6 together in close quarter. At other times in pairs, side by side or one behind the other with different partners at different times. The talk was easy, laughter raucous, the quiet peaceful. This trip allowed for easy travel and relaxed pace as our destination was not too far and packs were, in the main, light. The weather was kind although it hinted at a wilder, wetter, less kind manner. The snow was fantastic. This trip gave us the time to enjoy each others company, to hear and tell stories, to have a laugh and play. It gave us time in a relaxed and fun way to improve our technique and learn new ways, learn new experiences. 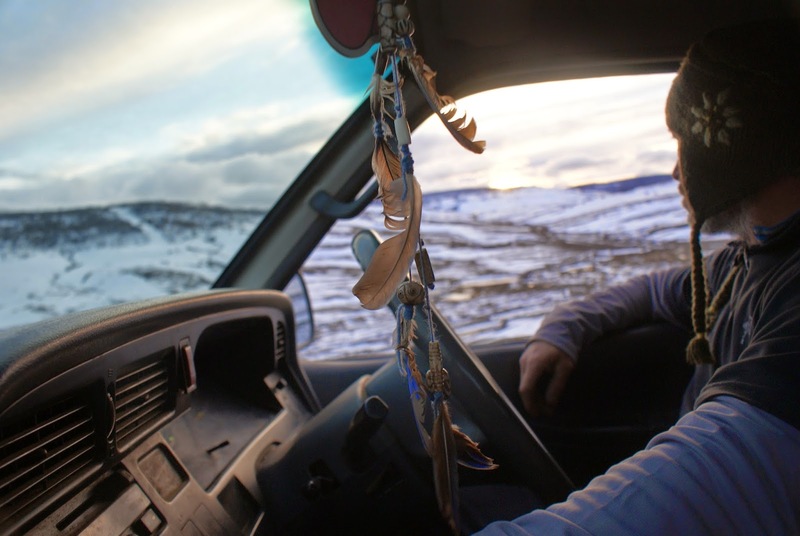 This trip opened up the experience of self-sufficient travel over snow to a destination of natural environment, where an old, rustic hut, steeped in the history of others, offered humble shelter and friendly warmth in a magic place. The 6 of us made it to Four Mile Hut, easily and the 6 of us made it back again, easily. 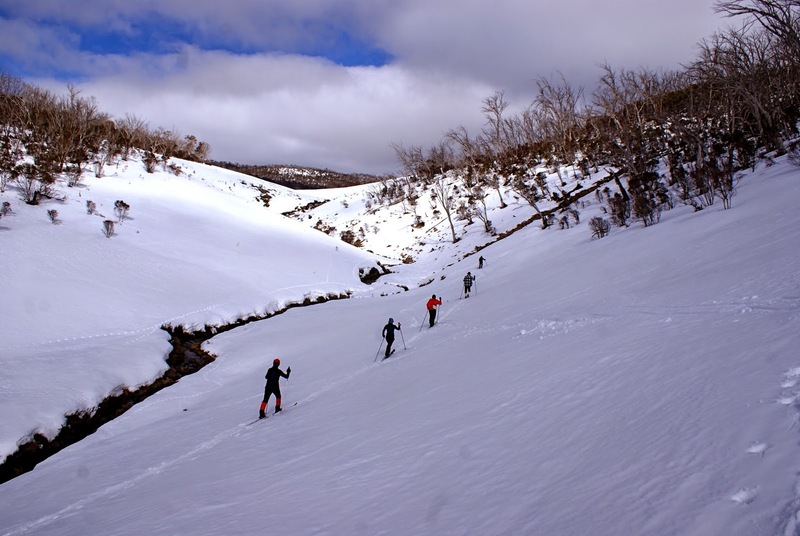 We explored on ski from Selwyn to Four Mile Hut, from Four Mile Hut to Broken Dam Hut, from Broken Dam Hut to Tabletop Mountain Fire Trail to where it meets with Four Mile Creek crossing. We rose on Sunday morning to a mostly clear and blue sky, fresh, and revived, put on skis and skirted east, skiing down through trees to Bloomfield Creek. We found slopes covered in good snow for us to glide and tracks in snow that animals could not hide. 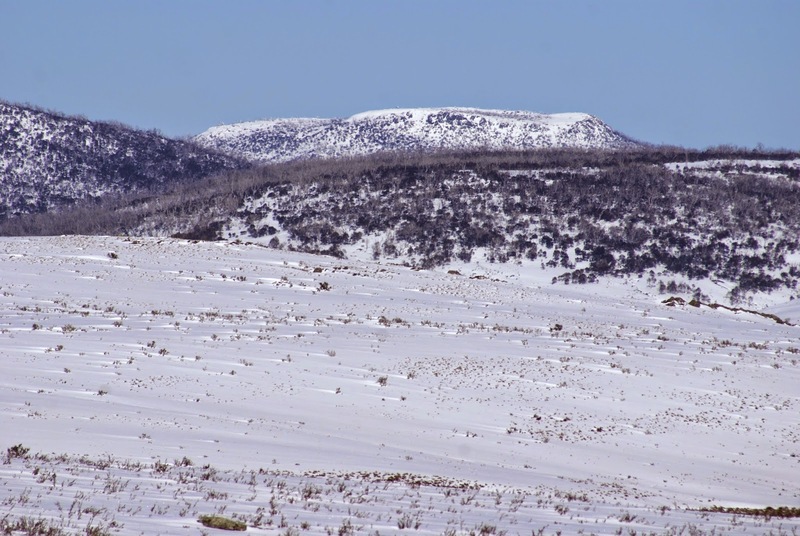 We ventured north to where we could see a snow covered Commissioners Gully rise from Four Mile Creek to the top of ridge treed. We followed the Four Mile Creek back upstream, snow cover holding deep on slopes becoming steep. We traversed slopes above waterfall on terrain testing and practiced turns on slopes not far from home. We had fun, skiing and playing in the sun. Soon back at hut we had our lunch, pulled down tents and prepared to depart. We climbed up out of the valley of Four Mile Creek, back onto the undulating spine of the Great Dividing Range to high point of 1600m. We travelled now back in a west, north-west direction away from the Tabletop Mountain Fire Trail and the valley of Four Mile Creek. 500m of easy skiing brought us to the broad, gently sloping snowfield. We crossed this time into the glowing sun of early afternoon. We gathered together. Behind us to the south and south-east, mountains could be seen at distance beyond the ravine: Mt Jagungal still with some cloud near its peak and Tabletop Mountain, clear, flat on top, snow covered, we saw this day, rising out of the snow covered rolling terrain. We lingered, admiring the last of the view and then we moved on back to Selwyn and to our homes beyond. This was a fantastic 2 days. The company was the best and the snow was great. We saw just a few other people exploring.